A classic of werewolf fiction, this was crime writer Gerald Biss’s only supernatural novel. 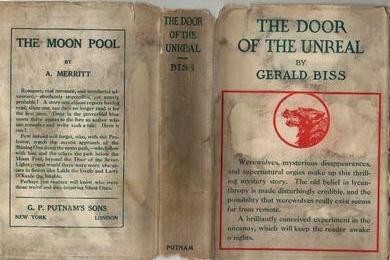 Having greatly admired Bram Stoker’s Dracula (1897), Biss uses a similar technique of presenting a casebook of ‘evidence’ to place an ancient evil convincingly within a thoroughly modern England. In doing so, Biss turns the werewolf into a threatening symbol of a regressive past, returning to invade a progressive, modern civilization in which urban expansion is on the increase and whose symbol is the ubiquitous motor car. As with Stoker’s vampire Biss’s werewolf is also a figure of the invading foreigner. The theme is especially resonant in Biss’s novel which, in the immediate aftermath of the First World War, presents its readers with a band of British and American allies who come together to fend off a German invasion of a different sort! Biss’s major source was the dubious (but entertaining) account of werewolf lore compiled by the paranormal investigator, author and perennial teller of tall tales, Elliott O’Donnell. This can be downloaded from Project Gutenberg. The text is taken from Daniel Correll’s website – a splendid collection of horror fiction formatted in HTML. My grateful thanks for his permission to use his work as the basis for the edition provided here. This entry was posted in Elliott O'Donnell (1872-1865), Werewolves and tagged 20th century, ancient evil, bram stoker, crime writer, door of the unreal, download, ebook, edwardian, epub, first world war, free, free ebooks, full text, gerald biss, Gerald Biss (1876-1922), german invasion, kindle, literature, novel, pdf, popular fiction, text, urban expansion, werewolf, Werewolves on June 23, 2013 by stylesofdying. It always seemed strange to me that the werewolf never had a seminal work, as the vampire did in Dracula. I was once told of Wagner the Wehr-Wolf, but the little I read of it seemed to add nothing new to the medieval lore already abounding, and it became hazy to me to trace the path from there to the modern creature. This does go some way towards filling in that path. Werewolves … Have We Forgotten to be Afraid of Them?